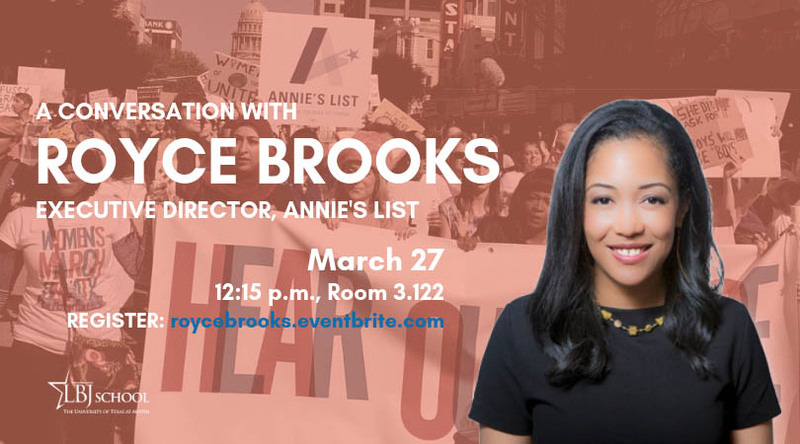 In 2018 Royce Brooks became executive director of Annie's List, an organization started in 2003 to recruit, train and support progressive women running for office at both the state and local levels in Texas. Over the past 15 years, the organization has raised more than $15 million to support these candidates and has helped them win more than 100 races, canvassing, holding training sessions, phone banking and driving voters to the polls. Before joining Annie’s List, Brooks worked with city leaders, researchers and community members to develop a policy agenda addressing inequality in Atlanta as the city’s first-ever chief equity officer. She served as the policy director for Sylvester Turner’s successful campaign for mayor of Houston and as the statewide policy director for Wendy Davis’s 2014 Texas gubernatorial campaign. Brooks has worked in both houses of Congress, including as a legislative counsel and subcommittee staff director in the United States Senate, and has been a policy analyst with the Joint Center for Political and Economic Studies and was a legislative assistant for Rep. Martin Frost (D–TX), the former chairman of the U.S. House Democratic Caucus.